Whales are often sighted dancing across the surface of the water, a trick they ripped off of dolphins. Whales are a group of morbidly obese aquatic animals. They are so massive that your mom jokes naturally gravitate towards them. Despite this, whales are a crucial part of the marine ecosystem, helping defend the world against the tyranny of giant squids and sharks. In scientific communities, whales are often called "crustaceans". This is due to their often barnacle-encrusted hide, which provides a natural defense against shark attacks, harpoons and close-range shotgun blasts. They are not to be confused with "cetaceans", which are the aquatic bugs often found in their natural habitat at Red Lobster restaurants. The term "whale" originally referred to female humans of a comparable size in its original Old English usage. When mankind first ventured out to sea in ships too large to qualify as rafts, they encountered the animals for the first time, and gave them the only name they could think of, immediately thinking back to the girth of their nagging wives. Both meanings of the word continue to be in widespread use today, thanks to the advent of McDonald's saving the older variant of the term. The most distinguishing feature of whales is their massive size. Their gigantic size ensures they remain at the top of the food chain, which in turn means they eat more food, causing them to perpetually become even larger in size in a vicious cycle. Despite their size, a mouth, eyes, flippers and a finned tail remain visible, but only remain obviously so until the whale graduates to dwarf planet status. The constant overeating also means that about 95% of the whale's body mass consists of fat tissue, a proportion exceeded only by the typical American. This fat is called "blubber", owing to its chemical similarity to flubber. It was once believed to keep whales warm while exploring the cold depths of the ocean, but is now recognized through careful observation of whales in the wild as their means of locomotion on land by bouncing from one coast to the next, traversing through the air by about 1.25 miles per leap. A common safety awareness poster near beaches, advising visitors to leave whale extermination to the professionals. The remaining 5% of a whale's body mass is primarily pressurized helium. Whales are so heavy that they would naturally sink without this important source of buoyancy. The helium is a naturally-occurring byproduct of their internal nuclear fission reactors, a mechanism the military has crudely imitated in the creation of nuclear submarines. These reactors make eliminating whales a dangerous proposition, for it is for this reason that they are known to explode. 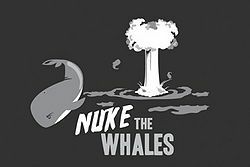 The only known safe way to slay a whale is to nuke it, where the resulting explosion is at least somewhat controlled. The extreme sport of whale skewering emerged as a more environmentally friendly alternative for exterminating unwanted whales, but experts strongly discourage against its continued practice on safety grounds. A common misconception about whales is that they are a type of fish, given their finned appearance. This myth has long been debunked by scientists, who more accurately classify whales as overweight dolphins. For those without comedic tastes, the so-called experts at Wikipedia have an article about whales. A whale's diet in infancy consists primarily of krill, which are the only animals stupid enough to swim near a baby whale's mouth whenever one is nearby. A whale eats simply by opening its mouth; this creates a vacuum within the oral cavity from all of the displaced water, sucking anything else nearby inside whether the whale wanted to eat it or not. 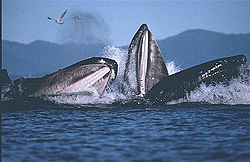 However, as whales are fond of their various vocalizations, they simply cannot help but open up every once in a while. As the whale grows, larger objects can get pulled in. First fish will be taken in, then larger fish, then human divers and possibly sharks. Small boats can be sucked in near the surface, which eventually moves up to fishing vessels, barges and cruise liners. The whale's powerful stomach acids dissolve everything it eats with a very high degree of efficiency, ensuring nothing goes to waste. Once whales become large enough to eat small islands, the government will typically send in a special ops whaling force to take them out. To help ensure this extreme situation does not occur too frequently, Japanese whaling vessels will periodically cull the larger members of the herds for national security purposes. Humans have learned much of what they know of whale language by watching their foreign films. The above image is a still shot from one of their classic slapstick comedies. Animals with a larger body mass also tend to have larger brains, and whales are no exception. Their large brains enabled them to develop their own language over millions of years, which scientists have still not managed to fully translate. This is often attributed to the sheer grammatical complexity of whale communications, but some scientists also blame the very slow speed of whale speak leading to translation being equally slow. An open question is whether whales speak so slow as a means of "dumbing down" their conversations for us. The language of whales is an elegant one, consisting primarily of vowels and the letter "W". The moans, rumbles, screeches and warbling involved when speaking whale make it even more romantic than French. Whales and humans have had a long, often violent shared history. The official logo for the Whale Equality Movement, which sought to end whaling and other forms of whale cruelty and inequality with humans. Not long after humans first discovered whales, they decided to mindlessly exploit them like much every other endangered species on the planet. Traditional whaling technique mandates the use of a harpoon, which is essentially a pointy stick fired from a gun with a rope attached. Whales are easy targets to shoot since they are very large. However, the tricky part is successfully stabbing them without triggering a thermonuclear detonation (see the "Morphology and anatomy" section above). Thus, only the most experienced sailors and occasionally pirates can become professional whalers. Once the whale has been sufficiently harpooned, lower-ranking crew members aboard the ship will reel it in for the finishing blow. Using all of their prior experience clubbing baby seals, the whaler must advance upon the angry whale's head and beat it repeatedly with a bigger, thicker stick. Performance-enhancing drugs may be consumed prior to this undertaking, although it is considered poor sportsmanship. The killed whale has many commercially-useful body parts, but the blubber is the most useful by far. The blubber can be used as a natural alternative to butter or margarine in its solid state, or it can be melted down for use in fast food grease fryers or automobile gas tanks. The large size of bouncing, explosive whales has made them invaluable for minesweeping during both World Wars. Deceased whales continued to be useful in the field as the starting point for airship and blimp construction. 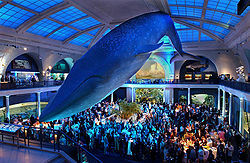 The large size and natural helium content of whales suited them to this purpose, although hydrogen and thermite were often added to better support the carcass in the air. This lack of good judgment lead to the Hindenburg Disaster, and the discontinuation of the practice despite no fault of the whales' own. Small doors and discriminatory food consumption policies have long been used to keep whales away from banquets and Chinese buffets. After centuries of persecution, modern societies have sought to grant whales equal citizenship. Efforts have been made to accommodate whales in public, such as by including drivable carts in Walmart. Unfortunately, many advocates for whale rights point out that little more progress has been made since the programs' initiation. Many employers and airlines are accused to not working to allow "reasonable accommodations" for whales. For example, the latter is infamous for its insistence on closely-packed seats so smelly strangers can fall asleep on fellow passengers' shoulders and snore. Unfortunately, whales have so little space that they are forced to fall asleep on everyone on the flight. Some airlines, in response to the criticism, are attempting to address this inconvenience for their whale passengers with the introduction of jumbo jets. ↑ This conveniently provides another way to differentiate whales from typical Americans. 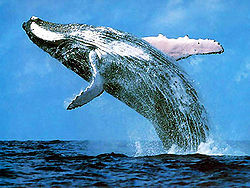 ↑ Primarily because speaking whale sounds similar to the mating noises of the other kind of whale. ↑ This was a significant improvement over the technique used in the first known accounts of whaling, where whalers just used sticks. This page was last edited on 7 August 2016, at 23:06.